“A fusion of Mediterranean products and traditional Japanese cuisine techniques,” ‘Meppon’ is a brand new cuisine spearheaded by the team behind ZELA – a restaurant backed by Cristiano Ronaldo, Rafael Nadal, Enrique Iglesias and NBA star Pau Gasol. 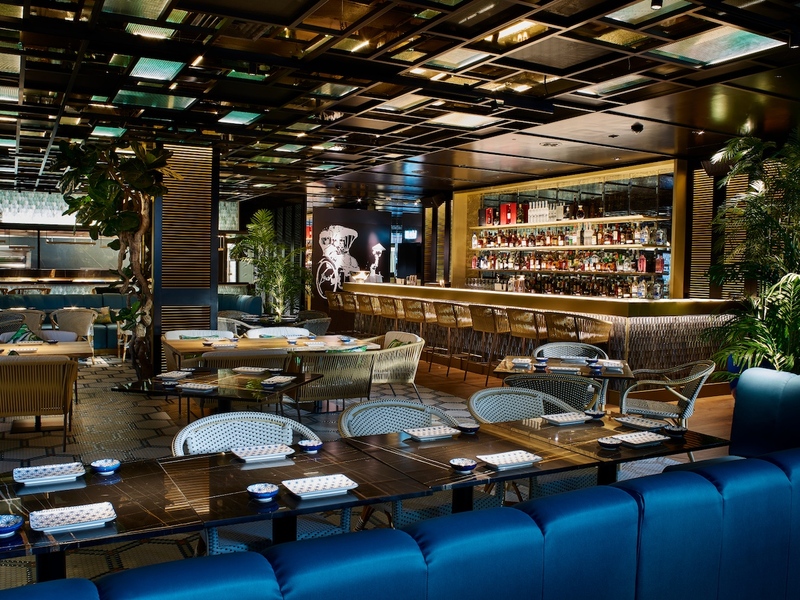 Following the success of MABEL Hospitality’s Ibiza restaurant of the same name, another ZELA was launched in London at the end of last year, taking over a space within the ME London Hotel, alongside Radio Rooftop and STK London. Past the doorman and blue velvet rope, ZELA’s vast dining room is almost empty during a mid-week dinner, low-ceilinged and furnished with stylish Ficus lyrata trees, glossy dark wood tables, wall-climbing foliage, and a live DJ who plays a soundtrack of bass-heavy dance music. Service is bracingly warm, with staff keen to make recommendations. According to the restaurant’s website, Meppon cuisine “respects traditional Japanese techniques while combining them with the best products that the Mediterranean has to offer.” Here, Michelin-starred chef and ‘gastronomic director’ Ricardo Sanz’s menu is deeply rooted in fresh fish and seafood from the Mediterranean, with raw dishes including various tatakis, tartares, sushi and sashimi. Dinner begins with a canapé of three rice crackers; bite-sized, flavourless vehicles for their toppings of fridge-cold burrata with smoked salmon and a film of tomato jelly, priced at an eye-watering £12. Four Japanese gyozas (£14) with paper-thin skins are considerably better, stuffed with a filling of shrimp “al ajillo” – a contemporary version of a Spanish tapas staple – almost good enough to overlook the pan-fried bases’ acrid bitterness imparted from an overly hot pan. Another Spanish influence is channelled through usuzukuri toro, a deconstructed riff on pan con tomate (£19). On paper, the dish is inspired, yet the execution is clumsy: serviceable, at best. 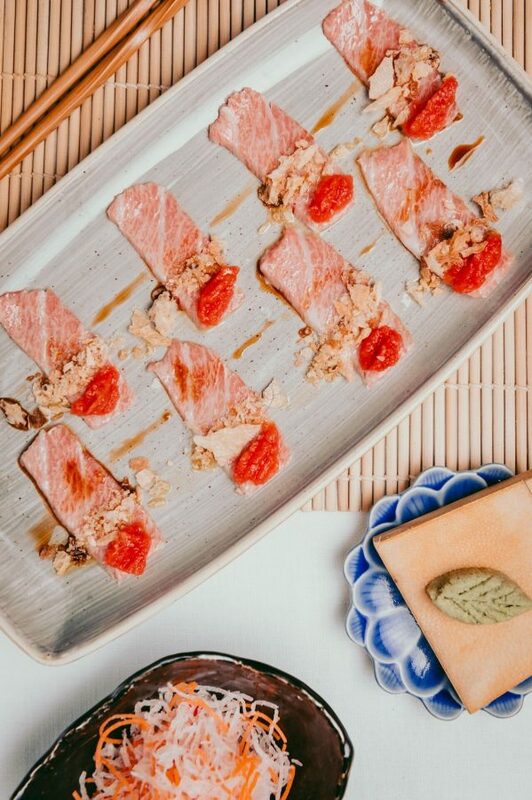 Eight thin slivers of fatty toro (tuna belly) are joined by a shower of bread crumbs and tomato that’s surrendered its flavour to the refrigerator. This is washed down with a heavily perfumed cocktail that’s gin-based and theatrically served under a cloche of smoke, overwhelming with its unremitting taste akin to the fierce aroma of Dettol. Two bao buns vaunt an unusual char, less pillowy than desirable, filled with deftly cooked ox tail that’s slow-braised yet bafflingly paired with fresh mint leaves (£18). Dominoes of nigiri capped with white truffle paste and a fried quail egg (£4.50 each) have decadent, mouth-coating richness, while soft shell crab uramaki (£14) provides the meal’s undisputed highlight. Eight maki rolls are book-ended with rolls impaled by lightly battered legs, each replete with a tempura crab and fatty avocado, prettily coated with ‘spun’ egg. One of the menu’s few meat-centric dishes, a main features two coins of luxurious Wagyu beef that’s slow-cooked for 48 hours (why?) and lavished with a sickly teriyaki sauce, served over a mattress of celeriac puree that’s as cold as the grave. Another feature of the main course menu, ZELA’s fried rice is a parsimoniously portioned side dish. The cooking of the rice is fine, flecked with sautéed mushrooms and truffle shavings, yet the crowning onsen tamago (slow-cooked egg) is drastically undercooked: reason enough to dive onto the ground, burst into tears and call “foul-play!”. We order one dessert to share. Touted as maki with Nutella and strawberry, the result is – in fact – a flimsy pancake concealing vanilla ice cream studded with strawberry gel: an arctic roll for the terminally tasteless. Sure, ZELA’s Meppon Cuisine does have its occasional moments, but otherwise it’s an abominable Franken-cuisine. ZELA London can be found at Me London Hotel, 336-337 Strand, London, WC2R 1HA. Is this the most disappointing steakhouse in London?